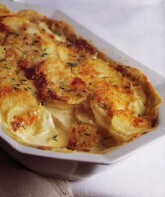 Gratin dauphinois, the chic sister of scalloped potatoes, must be the ultimate comfort food in winter. This superlative version was passed on to me by Chef Fernand Chambrette, a brilliant, cantankerous man whose cooking on a good day was legendary (don’t mention the bad days). The chef simmers the potatoes in milk to remove their tannin content, which would otherwise turn them brown and curdle the milk. The milk is then discarded and the potatoes are cooked again, in cream this time, to an inimitable, melting softness. I really prefer my gratin dauphinois quite plain, but a little bit of garlic can be rubbed around the dish before adding the potatoes, or a few chopped chives may be stirred into them. For a more substantial dish, fry some bacon until crisp and add it to the potatoes before spreading them in the gratin dish. Most importantly, be sure to use a floury potato for gratin dauphinois, such as an Idaho, and genuine Gruyère cheese – you’ll only need a bit but it makes all the difference. 1. Peel the potatoes and cut them in 6mm/¼in slices – they are best sliced evenly using a mandoline slicer if you have one. Add them at once to the milk in a saucepan so they do not discolor. Bring them to a boil and simmer until almost tender, 15-20 minutes (potatoes take longer to cook in milk than in water). Milk and cream scorch easily, so use a heavy pan with the heat just at medium. Stir the potatoes quite often, but take care not to crush them once they start to soften. 2. Drain the potatoes and wipe out the pan. Return them to the pan with the heavy cream and crème fraîche. Season them to taste with salt, pepper and nutmeg, and bring them just to a boil. Simmer until very tender, stirring occasionally, 10-15 minutes – if the potatoes boil, the cream will curdle. 3. Butter a medium baking dish and spread the potatoes and cream in it – the mixture will be quite sloppy. Sprinkle the top with the grated cheese. 4. To finish: Heat the oven to 175°C/350°F/Gas 4. Bake the gratin until very hot and browned on top, 25-30 minutes. Getting Ahead: The gratin can be made ahead and refrigerated up to 2 days. Bake it in the oven just before serving. On the Side: Gratin Dauphinois is classic with roast lamb and beef steak; as a lighter option, Vodka and Sesame Salmon (p.00) contrasts perfectly with the rich and creamy texture of the gratin. In the Glass: A rich red wine, one of those fruity Merlots from the New World, would be my choice to highlight the potatoes, cream, and cheese. Winter perfection! Turnip, Root Artichoke (Sunnychoke), or Sweet Potato Gratin Dauphinois : Several root vegetables blend deliciously with potatoes to make unusual first and main course gratins (the starch in potato is always needed to bind the cream). I like to bake mixed vegetable gratins in individual dishes, great for entertaining. Substitute 450g/1lb turnips, root artichokes, or sweet potatoes for half the potatoes. Peel the roots and slice them like the potatoes. Simmer them separately in milk as they will take longer to cook, 20-25 minutes. Then mix the root vegetable with the potatoes and cook both together in the cream as directed in the recipe.